I like to imagine that if you saw me in a crowd you’d think rockstar or artist or writer or America’s Next Top Model. Okay, that last one’s a stretch, but a girl needs dreams. So here you go, friends. 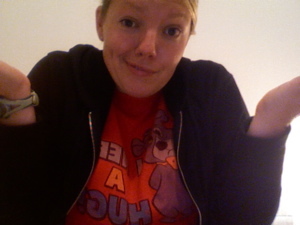 Me, the teacher, in all of my fashionable glory. 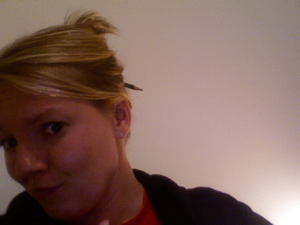 There’s a pencil in my hair. 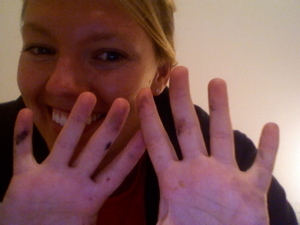 And paint all over my hands. Heaven, help me. I’m one step away from button covers and holiday sweaters. How about a chalkboard pin, a smudge of dry erase on the nose, white socks and tennis shoes no matter what, and a chain to keep up with your reading glasses? And what about you don’t see . . . underwear that has long given up, knee highs, and cracked heels? Does that say enough about me? i feel like you’re trying to make a kissy face in that first picture. you know… like all the hookers on facebook do. eww. You can bet when your students see you in a crowd they think you are so much better than America’s next top model! Thanks. I got to check it today. Catherine is here with me. She’s says to tell you, “There’s no place like home.” She, mama, and I are piled on an air mattress in my living room. Good times. You look way too cute to be put in the same category with holiday sweaters (which, by the way, I think every single one of my elementary school teachers wore). This made me laugh sooooo out loud. And I must mentioned I lost my voice last week and am just now getting it back so I still have that hoarseness and the laugh just rattled the walls here. Too funny was the button covers…..hahahahah how long ago was that. Got to mention we are really getting in the Christmas spirit around here even though I am usually a stickler for…NOT BEFORE THANKSGIVING! Sunny 93 started Monday playing all Christmas and it is hard not to get in to it. I forgot! I agree with Lauren, I have to have this Monday through Firday. Emily, you are SOOO FUNNY! The hair is cute, and I must admit I’ve done it myself a time or two, but it does scream ‘LITTLE HOUSE ON THE PRAIRIE’…but you are sooooo much prettier and younger than any teacher on there…so keep on rockin’ it!!!! That was a little sarcasm in case you couldn’t tell. Not that I have anything against anyone who wears them, I just don’t think my wife would ever, and I do mean EVER, wear one of those.